You keep walking for a few more weeks. Or a month. Or a year. Or for decades. But your walking is not a smooth, confident stride in which you strike your heel to the ground and lift off with your toes. It’s marred with frightful balance and pain issues. Every step is hesitant and carefully placed. Often, your arms do most of your walking, grasping onto canes, crutches, doorways and walls. You can walk. It’s told to you as if it is the most terrific thing on the face of the planet. Walking is better than world peace. It’s better than sunshine and rainbows and leprechauns. It’s better than winning the lottery. It’s far better than being wheelchair-dependent. 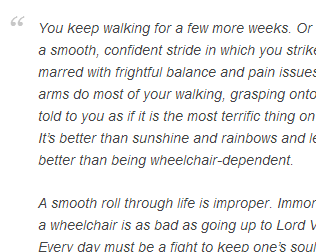 The scary thing is that I have met many people with MS and many in the medical world who hold that view that walking (however inefficient) is much better than flying around in a wheelchair. The medical world talks about being “confined to a wheelchair”. I’m not sure what is confining about my wheelchair. I think I would be confined at home if I didn’t use one. My world is so, so, so much bigger when I have wheels. I have discovered a practitioner who does some specialized physical therapy/stretching with me, he once asked me what my goal was, did I think I wanted to work to be able to walk again. I thought briefly and decided that I didn’t want to walk. I will never be able to walk as fast as I can roll (especially downhill) and you can’t get flashing wheels on your feet.